MyConstruct provides the ability to sync invoices, orders, contacts and groups with Xero. Connecting your MyConstruct account to Xero is easy and very worthwhile if you’re already using Xero for your business accounting. Navigate to your business settings, which is in the top right menu of MyConstruct. You can then view your Xero Settings by clicking the "Xero Settings" Tab. Connect MyConstruct to Xero by clicking the "Connect to XERO" button. During the connection process you will be redirected and asked to sign in to your Xero account where it will ask you to allow MyConstruct to access your accounting data. Click "Allow Access". 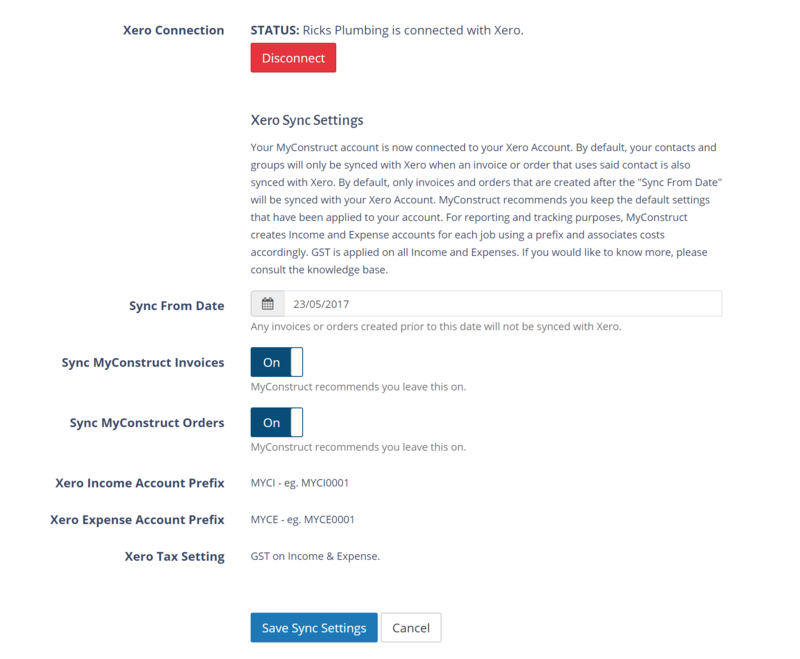 Your Xero Account will then be connected to your MyConstruct Account and you will be redirected back to your Xero Settings in MyConstruct. There are three setting options available to you. Sync From Date: This is the date that MyConstruct will begin to sync data with Xero from. If you have previous data in MyConstruct that you would like to sync with Xero you can set that date to an earlier date. By default the date is set to the date you connected your MyConstruct account with your Xero account. Sync MyConstruct Invoices: By default this option is 'On'. By turning the switch off MyConstruct will no longer sync Invoices with your Xero account. Sync MyConstruct Orders: By default this option is 'On'. By turning the switch off MyConstruct will no longer sync Orders with your Xero account. By default, your contacts and groups will only be synced with Xero when an invoice or order that uses said contact is also synced with Xero. MyConstruct recommends you keep the default settings that have been applied to your account. For reporting and tracking purposes, MyConstruct creates Income and Expense accounts for each job using a prefix and associates costs accordingly. GST is applied on all Income and Expenses. Invoices are synced with your Xero account moments after the invoice has been generated. To view the generated invoice in your Xero account. Navigate in Xero to "Accounts - Sales". Then select the "Awaiting Payment" tab. You will see your newly generated invoice. If you edit an invoice in Xero, MyConstruct will also sync with those changes. If a change is synced back, MyConstruct will show an invoice as being changed by displaying the Xero logo on the Manage Invoices page. Orders are synced with Xero when the order is sent to a supplier. You can view orders that have been sent by navigating to "Accounts - Purchases". Then select the "Approved" tab to view your newly sent order. Synced Contacts & Groups can be viewed by navigating in Xero to "Contacts - All Contacts". From here you will be able to view and edit any contact that has been synced from MyConstruct to Xero. If you edit a contacts details within Xero that was formerly created in MyConstruct, MyConstruct will sync those edited details back into your MyConstruct account.